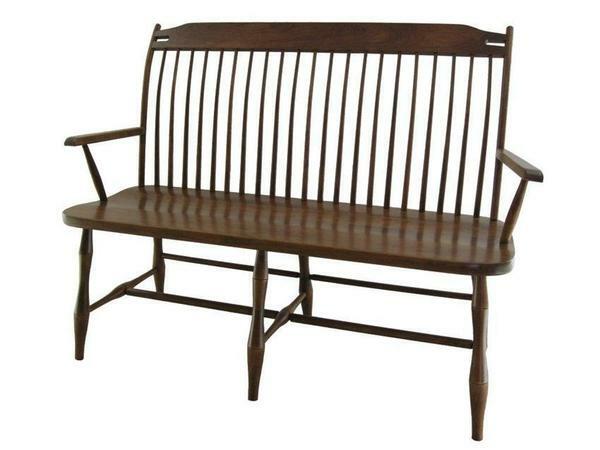 The Amish Birdcage Windsor Bench features delicate spindlework and turned legs, classic features of Windsor style furniture. The original Windsor was used as an outdoor garden bench, but the comfort it offered was so top notch that it developed over the years and has never lost its appeal. Comes in 3 sizes: 36", 48" or 60"
DutchCrafters offers furniture from Amish artisans that have developed their skills for decades. Learn more about our Windsor furniture and how it can be customized. Please email or call an Amish Furniture Specialist for assistance. Thanks for shopping with us. Length: 36", 48" or 60"
I’ve just completed the survey that was emailed and it reminded me to send you the images of the new benches in the Court House. They are perfect and I’m so glad we went with the distressed time-worn black finish. It complements the room [Bedford's 1787 Court House] and highlights the wrought iron hardware.